To allow some equipment to remain on during the work temporary cooling (the large grey box on left) was used. For users of ARCCA services, December is an important month due to our datacentre having been mostly shutdown whilst work is performed on the cooling infrastructure and other internal changes. 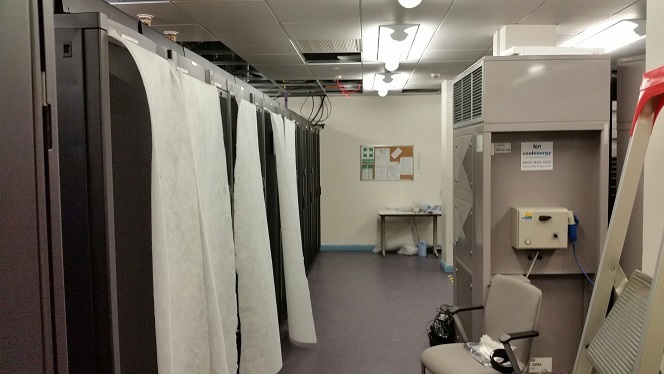 This has required a disruption in our services but in the long-term provide a more resilient cooling infrastructure and space to house more hardware. The decision to disrupt are services was not taken lightly and required careful consideration of all stakeholders who use this room. December was chosen as the month which least affects IT services across the University and allows plans for the service to resume before Christmas where a lot of work is usually performed on our HPC system Raven. The main reason for the shutdown is to perform maintenance on the chiller infrastructure and install 3 new chiller units to replace 3 old units of various degress of age. 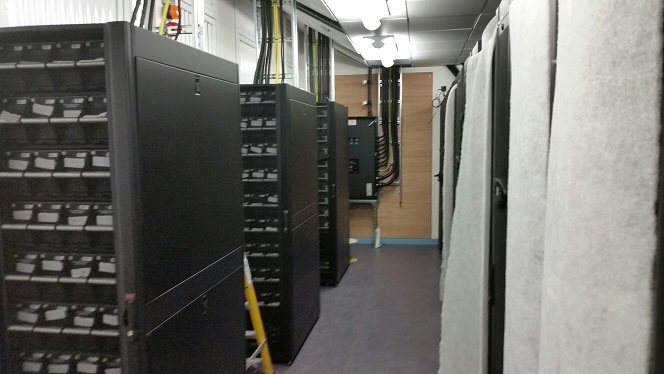 Since the chillers provide the cooling to the room where the HPC hardware and other equipments uses a lot of electricity (remember that all energy eventually gets converted to heat) we had to switch off the majority of the equipment. The other reasons are to reorganise the current configuration of hardware to free up space for newer hardware and to install more power into the room. To illustrate the work being done in the room, the following pictures show the initial work in the room. 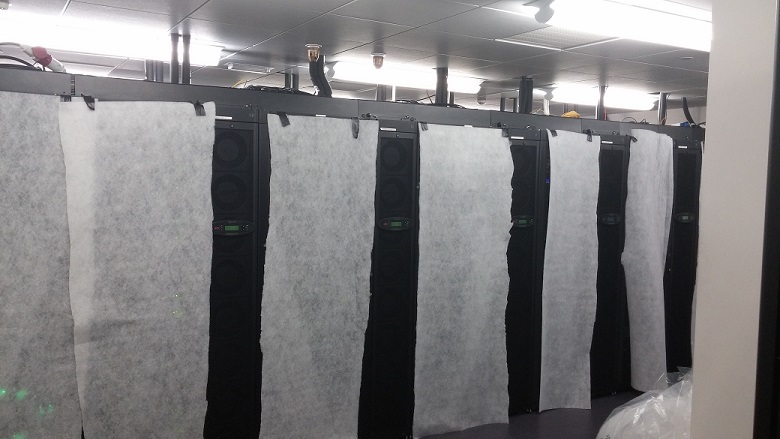 Due to the work being performed in the room, filter sheets were used to reduce the amount of dust entering the equipment. Due to increase in demand a new power feed was required into the room. Currently preparation work is being performed to allow the new chillers to be craned into place outside the datacentre and the hardware reorganisation will have finished this week. We are hoping these little updates on progress in the room will allow a better understanding of the reasons for shutting down and hope that the longer term benefits can be seen. Updates will be provided through this blog and the usual ARCCA community mailing list.